Alan remembers an Autumn escape to Fiji back in 2011…..
Our first stop after clearing customs at Nadi airport was the Radisson hotel on Denarau island. Despite the distance being a paltry 12.7 kilometres, it took 45 minutes to get to our accommodation due to the atrocious condition of the road and the inclement weather. The road was a sea of mud in places and the potholes seemed big enough to easily swallow the taxi. In fact, there were times when we were sure from the graunching that our taxi was driving over some other poor sod whose taxi had been swamped earlier. Once on Denarau island however the roads were first class, as one would expect in a purpose built tourist resort. Having settled in to our room the heavens opened and it rained heavily for most of the night, as only it can in the tropics. The morning next dawned still and overcast. Judging by the temperature it would only be a matter of time before the cloud cleared and the sun came out with a vengeance. We checked out the beach on our way to breakfast and the water was “tinged with tea” as a result of the torrential rain carrying sediment into the sea. After breakfast I set up my spinning tackle and walked the beach front from the hotel to the next bay casting as I went. (see photograph “Spinning outside the hotel in Denarau”). Quite a strange experience as the beach had been carefully groomed and you could still see the rake marks. Nothing came to my bibless lure but regular bird activity betrayed signs of a work up well offshore in the clearer water. The best spot was at the end of the beach where a rocky headland separated a deep channel from the main beach. The large sign saying “No Admittance”, coupled with the relatively unstable nature of the promontory, kept me from venturing onto the rocks. I fished back to the hotel with a weighted jighead and soft plastic. En route I spotted some smaller fish feeding in the margins and did manage to get one to slash at the lure. It failed to hook up so all I was left with were a series of deep teeth gashes on the flanks of the soft plastic shad to remind me of my first encounter with a tropical oogly. 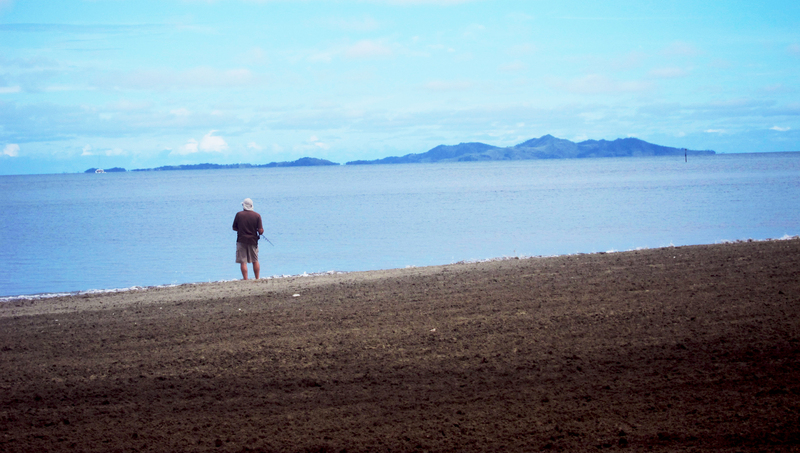 I opted not to fish for the next two days as we had booked on several tours and wanted to explore Denarau island further. The most memorable part of our stay was a meal of Marsala crab that we shared at a Fijian Indian restaurant. It was enormous and truly delectable, unlike anything we’d ever eaten before. On Tuesday we headed to Vomo island by ferry and this is where the fishing proper began. After we’d eaten lunch it was time for a swim in the beautifully warm, crystal clear ocean not more than 20 metres from our room. Imagine our delight when we flopped into the water and were surrounded by mullet, snub nosed dart and numerous other colourful tropical fish within seconds. Paradise. I opted to fish between 4.30 and 5.30 pm on the leeward side of the island as it coincided with the run down to low tide and dusk. I started with a soft plastic and it was swiftly claimed as booty by the weed coated coral about 20 metres offshore. On went a small (~ 2 ½”) popper and this was systematically worked at high speed through the channels between the weed beds. As dusk approached the fish started to move in the margins and before long the fizzing and gurgling popper got monstered in close by a small tropical barracuda. It was no match for the heavy spinning rod and ZeeBaaS spinning reel and it came quickly to the shore where I promptly removed the trebles from a mouth that was festooned with teeth like broken off toothpicks . Within two casts of restarting the popper was absolutely engulfed by a fish that was at least one metre long. I saw the bow wave an instant before the bucket sized mouth inhaled the popper. Giant Trevally and a good ‘un. I set the hooks and hung on for grim death. Line poured from the spool as the heavy drag on the ZeeBaaS reel growled in anger. The trevally headed into the coral within seconds, shook its head in disdain and straightened the body treble without a second thought. The air was blue. I’d just re-learned my first lesson on fishing in the tropics. Make sure that the treble hooks are all 4X strength as anything less is an accident waiting for a place to happen. Fortunately I still had the popper so I spent the next 10 minutes replacing the split rings and hooks with the heaviest ones that I was carrying. Back into the fray and within 20 metres from where I’d hooked the GT the popper was once again tracked down and smacked by another decent fish. It turned on its tail after it took the popper and hit the turbo boost when I set the hooks. This time the heavy drag setting quickly curtailed the initial run and from there we settled into a dour tug of war, it trying to wrap the line around the coral and me trying to keep it in the clear water. It did manage to wrap the line under a rock at one stage but I was able to free it quickly without too much fraying. Eventually the fish yielded and was drawn ashore. 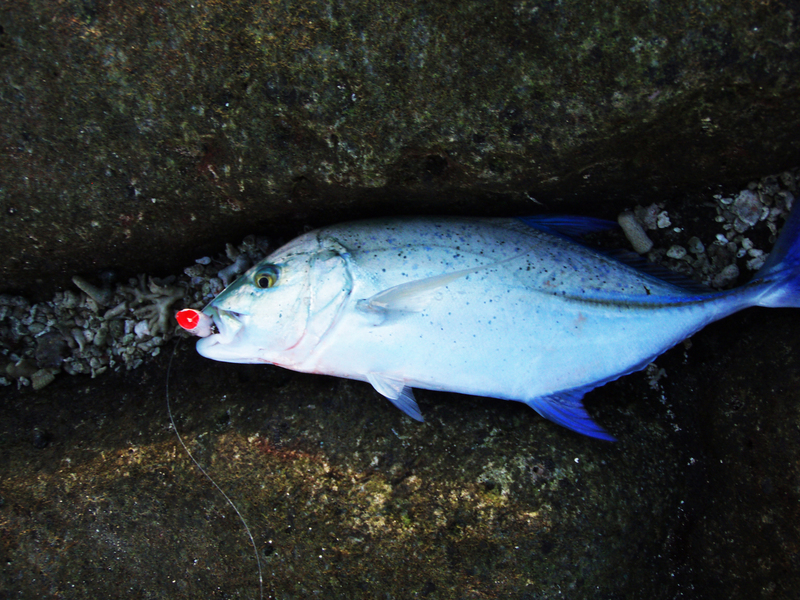 A bluefin trevally of around 4 lbs . I was stoked. What a beautiful fish. The electric blue fins were unbelievable. There surely cannot be a more exhilarating sight than seeing a popper get monstered in a flurry of foam by an angry pelagic. It was starting to get dark so I opted to head back to our accommodation. Rather than take the long route and follow the sand I opted to try and negotiate the slime covered coral to save time. Bad move. I lost my balance and from there it got ugly. Effectively I pirouetted on my good leg and kicked the coral firmly with the flailing, unsupported foot as I struggled to regain my footing on the slippery coral. I opened a 2” gash between the ankle and Achilles and the painful thwack of rock on bone was excruciating. Luckily there was a cocktail bar about 500 metres away so I was able to hobble there immediately, staunch the flow of claret and apply an ice pack to limit the bruising. This helped enormously until I had to walk the kilometre back to our hotel room. Fortunately “Doctor” Sandy was on hand to clean it up as soon as I got back and the pain subsided as the Panadol took hold. Unfortunately the injury curtailed my fishing sessions on Vomo island somewhat. Any thoughts I had about walking to the edge of the shelf to fish the deeper water had to be put on hold as it was obvious that I didn’t have the footwear and also the potential to attract unwanted attention with an open wound was a major disincentive. Lesson two and three are wear appropriate footwear (flats boots) and always carry a first aid kit. I’d almost go as far as to include a compression bandage in the first aid kit. My ankle seemed OK in the morning so I fished twice the following day. The morning session ran from 6.30 – 7.45 am and the afternoon from 4.00 – 5.30 pm. The early morning session was amazing. Large GT were harassing baitfish in the margins and it was like someone was pushing a jug underwater at high speed, such was the size of their bow waves. I used a long pencil popper that was weighted . It cast for an eternity but I had to wind like a man possessed to keep it on the surface. The large fish powered in to check it out but none took which became frustrating after a while. Several long toms also charged in at speed and missed the tail treble which added to the general excitement. The evening session signalled more of the same although there was less visible feeding activity as the tide was still only half out. I lost the large pencil popper on a coral outcrop and was forced to change back to the small popper. Remarkably I hooked up almost immediately on a decent fish (another bluefin but larger?) only to suffer the mortification of losing the tail treble, split ring and body hook to which they were attached as soon as the pressure went on. Lesson four learned is that one must ensure that the popper attachment points are continuously wired. By Thursday my ankle had started to heal but the downside was that it had begun to stiffen up appreciably as the scab started to form in earnest. I was able to fish but it was hard work to hobble along the shore in the soft sand and I must have looked like a drunken crab with a hernia. My popper supply was dwindling so I had to rely on a couple of Rapala Skitter pops and two Rapala stick baits. 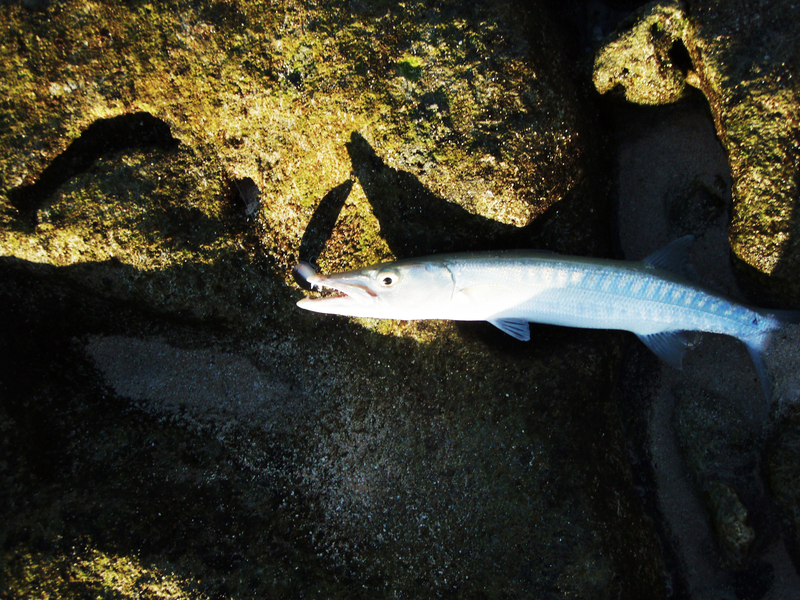 I fished between 3 – 4.30 pm but the tide was well in and it was dead. There were heaps of mullet, long toms and barracuda visible in close but their movements were languid as they lolled about in the fierce sun. I had a few follows from small trevally but nothing came close to claiming the lure during the session. Friday was a ditto day as I was forced once again by circumstance to fish in the mid – late afternoon which by now coincided with high tide. Lots of visible fish but no hook ups. What did I learn from this? Fish the change of light and if this coincides with the run down to low tide then tie on you heavy kit and hold on for the ride. Vomo island is a truly beautiful place. I have vowed to return with a heap of poppers, proper footwear and a first aid kit sometime soon. My e-mail is alan@hawkinswatts.com. Are you in Auckland?